With winter on its way, now is a better time than ever to inspect and fix any damage to your roof in order to keep your roof in good condition. Altogether, we want to provide you with the best possible roof over your head. The best way to achieve this? By checking and paying attention to the below aspects of roof care! Your roof’s gutters are its ultimate protectors. They prevent leaks and damage by clearing water from the roof. This system even protects a building’s foundation! 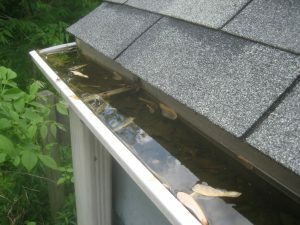 However, leaves and other debris are known to clog gutters occasionally, which can mean bad news for your entire roof. Gutters simply won’t work properly with any kind of clogs, leaks or blockage. Thus, it’s important to clean the gutters at least once per year to protect your whole roof! Flashing is the metal protecting all the crevasses of the roof, from the downslopes to the chimney. Basically, anywhere two planes of your roof meet, there needs to be flashing. Some older houses don’t have metal flashing, and instead have rubber, which doesn’t last as long. Making sure the flashing is properly affixed to your roof is an excellent way to keep your roof in good condition! Finally, roofs need proper care and maintenance in order to last a long time. Thompson Roofing & Reconstruction is here to provide it! We can check for any leaks or other concerns before they become apparent. This saves you the stress of worrying about the state of your roof. It also saves you money on extensive roof repairs. Ready to put us to work? Call (573) 789-8367 for our roof maintenance services in Lake Ozark, MO! Posted in Uncategorized on November 8, 2016 at 5:25 pm by Thompson Roofing & Reconstruction.